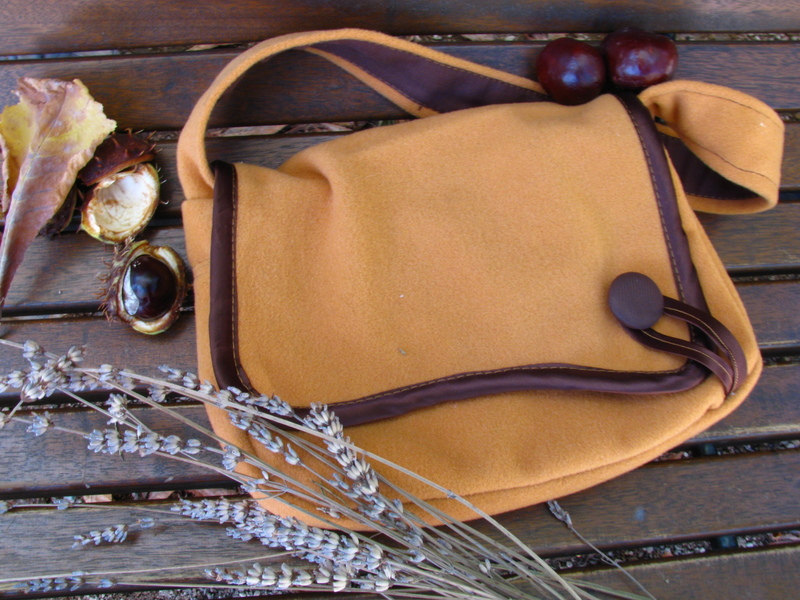 Warm and soft at the touch, golden and graceful at the sight, this fine cloth shoulder bag is perfectly tuned with Fall's colors. It takes less than a second to catch its versatile nature: cute and elegant when worn at special occasions, functional and capacious when choosen as a companion in your daily routine. The warm brown lining matches with the bright chocholate tones of the satin weave trimmings that pace along the curve flap margins. Lantern Bug always has watchful eyes for details - look at the right bottom: an organdie-covered handmade button and a satin weave golden-stitched ribbon keep your autumn-colored treasure fastened in such a cute way! Golden Fall has been exposed at the ArteStrasse fair in Brescia, reaching so much approval and appreciation. Don't miss out the chance to make it yours: gift yourself or a loved-one the warm and bright colors of the Autumn. Click here to get to the store page, where you can find further infomation and some more pictures: the cutest item of the season is waiting for you to grab it!